One's a carnival strongman, the other is a fitness fanatic from the Chocolate Factory. But when they are together, hilarity ensues through their wild and wacky podcasting adventures! Concrete Davidson has been a mainstay of Australian wrestling since 2011. He has wrestled for major promotions all around the country and resides in his home state of New South Wales. A trailblazer of the old-fashioned style and manly ways, he is the true original old time strongman of professional wrestling. Big Fudge is New South Wales’ sentimental fan favourite with a heart bigger than Willy Wonka’s chocolate factory. He is a masked marvel who boasts an alleged height of over 7 feet tall and loves fitness and showing off his guns. He famously won over the support of fans with the 2016 #GiveFudgeAChance movement. Episode 40 of Conco & The Fudge with special guest Party Boy Jax. Joined by the newest member of BSCG, Jax Jordan joins us to discuss his roots in Wagga Wagga, early training, weight loss, teaching himself to create posters, edit videos, the Party Boy origins, moving to Sydney, his current involvement in PWA and much more. Episode 39 of Conco & The Fudge with a mysterious Mystery Guest. Who can it be knocking at my door? Go 'way, don't come 'round here no more. Can't you see that it's late at night? I'm very tired, and I'm not feeling right. All I wish is to be alone. Stay away, don't you invade my home. Best off if you hang outside. Don't come in, I'll only run and hide. Who can it be now?. Episode 38 of Conco & The Fudge with special guest Diego. We are finally joined by the beloved ring announcer, wrestler and friend to all who meet him, right on the eve of his sendoff at PWA Black Label. We cover his acting background, how his love for acting led to his love for wrestling, Shakespeare, opportunities he’s been given as a ring announcer, what’s next for him in Vancouver and much more. Episode 37 of Conco & The Fudge with special guest Headhunter Rig. On the afternoon of Newy Pro’s 7 Year Anniversary in Charlestown we caught up with one of the most promising talents in NSW. Rig spins a couple of yarns for us, as well as covering the changes he and the House of Free Fighting have gone through, his involvement in the 18+ Hoose Parties and more. Episode 36 of Conco & The Fudge with special guest Kyle Fletcher. The “Aussie Arrow” was back in the country briefly after spending a year and a half making a name for himself in the United Kingdom. We have a light chat about his time over there, his dream match against Lushin Liger, becoming Progress Tag Team Champion and much more. Episode 35 of Conco & The Fudge with special guest Paris De Silva. The Spartan of the Skies joins us to cover some of his young but storied career so far. 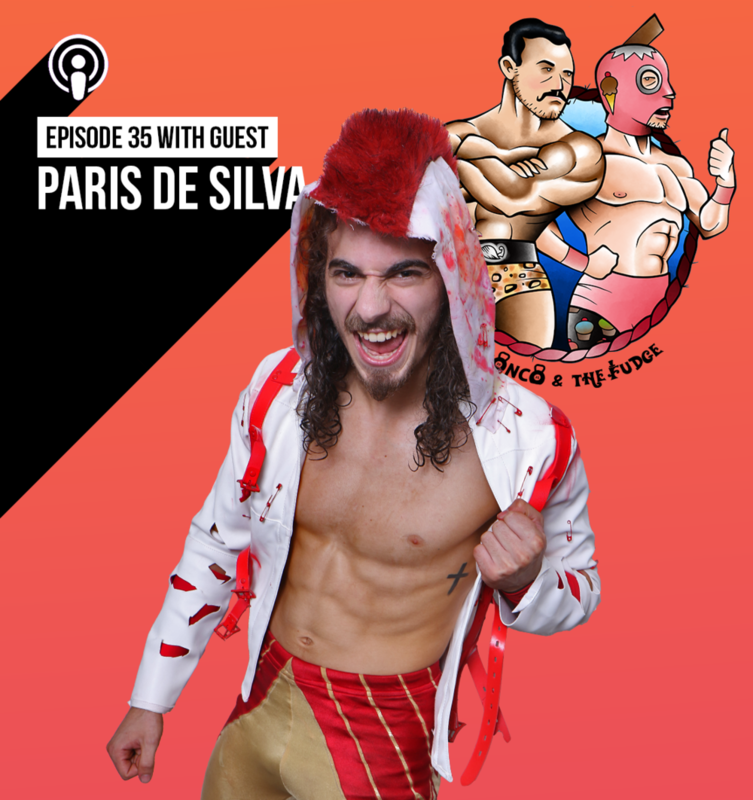 We discuss his beginnings at the Australian Pro Wrestling Gym, teaming with Jude “The Dude”, journeying to Japan and the LA Dojo for NJPW and going viral recently after PWA Call to Arms. Episode 34 of Conco & The Fudge with special guests Hamish & Andy. Conco was invited to be part of The People's Press Junket for the launch for True Story Season 2, resulting in a fun catch up naming fellow members of our roster for about four minutes. Concrete & Big Fudge cover a few other things while in Star Bar, like the impending Call to Arms at Max Watts. Episode 32 of Conco & The Fudge comes to you live from the gimmick table at Supanova for the launch of the new Conco & The Fudge comic book! We are joined by one of the artists behind the comic and creator our podcast artwork Gooney Toons and anyone who walked by and visited our table on the day. Episode 31 of Conco & The Fudge with special guest Mick Moretti. The Rapscallion joins us over burgers to recap his recent adventures. We cover his journeys through the USA during 2017, the development of the Master of Mischief, the #youregonnanoticeus movement and much more.